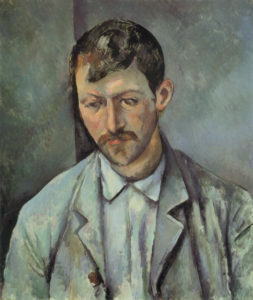 The portrait of a peasant that he painted at about the same time as the one of Madame Cézanne in the conservatory could not be more different: angular everywhere (in nearly everything about the face and clothing: hairline, eyebrows, ears, nose, moustache, chin, collar and lapels, and the set of the shoulders), downward pointing and heavy (in the cast of the eyes and the massive bottom), and bristly in its touch (with the touch giving form to the unkempt hair, the unshaven cheeks, and the rough coat). But it is far from the lesser picture; seemingly informal, its forms are in fact carefully considered (note the light that Cézanne introduced into the neck to elongate the mass of the head), and all resolve into a perfect consistency of form and a unity of touch with meaning. The color—that is, the color chosen to complement the skin tones—is once again new; it is a dirty grey-green composed of olive tones and blue-greens, and it both balances the deep reds in the skin and emphasizes them. The touch in this portrait is subordinate to the color and to the angular texture of the whole. As in most other portraits, the touch is generally not a system, but an instrument that serves the whole: it can be either faint and uneven, in which case it simply does not matter in the composition, or it can be visible and uniform, in which case it may convey character, age, or situation. 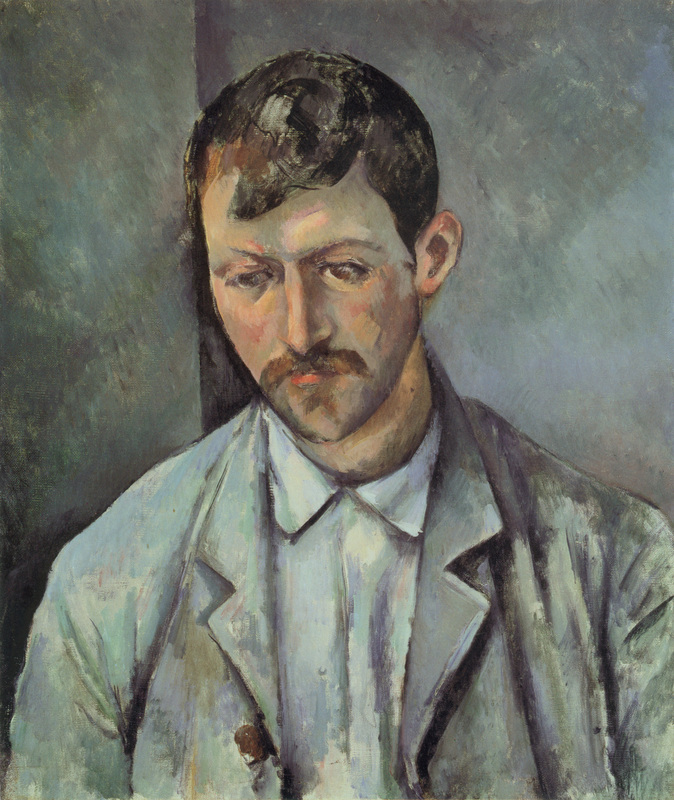 Whatever Cézanne’s formal intentions or achievements, in a portrait there would be neither complex textures to organize nor a deep space to manage, as in landscape, and the composition would be dominated by the face; this would limit the responsibility that could be placed on the touch. 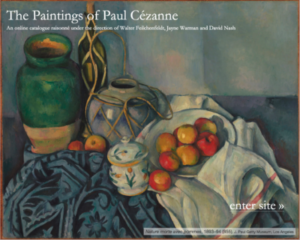 Cézanne’s need for form would be satisfied by composition, color use, and internal consistency. Source: Machotka, Cézanne: the Eye and the Mind.